showing improved power and patience. As we get ready to turn the page into September, it's time to look toward the 2015 playoffs. The Kansas City Royals, last years' playoff sweethearts, look like a lock to make their return to October baseball, and currently lead all of baseball with a 100% chance of winning their division (at FanGraphs, projection method, and I'm sure that's rounded). 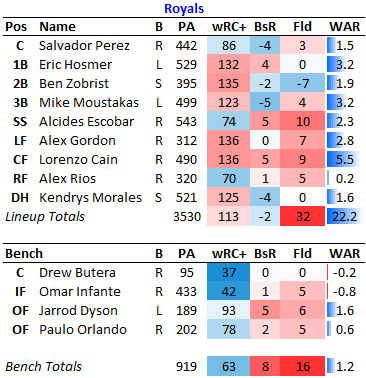 I did profile the Royals in May when they faced the Reds, and the team the Reds faced then bears a lot of similarities to their August version, though with two main differences. First, the Royals offense had been ridiculous through the first month and a half, but has settled down to post solid-average numbers. That's still better than last year, but they're not doubling people to death anymore. Second, their rotation has improved, in no small part thanks to the Royals' acquisition of one former Reds ace, Johnny Cueto. Still, the hallmarks of this team are constant. They field better than any other team in baseball, they have a killer bullpen, and they do the rest of it good enough to be a very good all-around team. And I like them better in the short playoff series format than over the long season because they can leverage their bullpen more, and they can lean on Cueto, and they have some good bench pieces that they will be able to use to mix and match their way through series. They look really strong, and will certainly be a team that I will cheer for this postseason. I'm making some guesses here. Alex Gordon has been out with a bad groin injury, but is currently on a rehab assignment and should return to the lineup soon. He'll take his job back in left field. That leaves new acquisition Ben Zobrist, Omar Infante, and Alex Rios to divvy up time between second base and outfield. I've always like Infante and two offseasons ago advocated for the Reds to go after him to help them justify unloading Brandon Phillips. Nevertheless, had a completely miserable season. Alex Rios hasn't exactly caught the world on fire this season, but I just don't see how Infante could keep his job once Gordon returns. I'm burying the lede. The biggest story on this team is probably the revitalized careers of Eric Hosmer and Mike Moustakas. Last year, Moustakas was sent to AAA due to ineffectiveness. Last year, Hosmer was a replacement-level hitter. And then, in October, they both seemed to find their stroke, and it's carried forward into this year. Both of them have cooled off from their hot starts to the season, but they are both now solidly above-average ballplayers that anchor the team. And if they're not the biggest, then we have to be talking about the amazing year of Lorenzo Cain. Cain has hit every bit as well as those others, while playing his typical brand of sparking defense in center field and brilliance on the basepaths. Last year, you might have argued that his 5-WAR season was due to inflated fielding numbers. But his bat has taken a step forward this year, and he's in line to reach 6 WAR by season's end. He might not be the best CF not named Mike Trout just yet, but he has to be in that conversation. The Royals continue to let Salvador Perez play roughly 5 out of 6 games. His offense has slipped as the season has gone on, and one has to wonder if the workload has something to do with that. If I were Kansas City, I'd at least try to get him rest in September now that the division is more or less wrapped up. He is a good hitting catcher, but he may be too fatigued to show it. 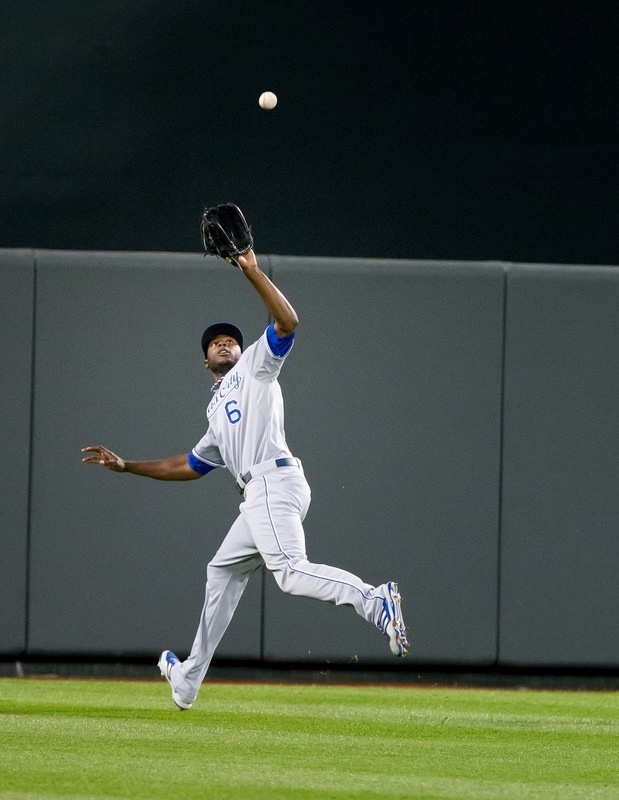 I also want to give a nod to Alcides Escobar as a quality fielding-first shortstop. I don't think he gets a lot of respect, but he has been solid and dependable the last few seasons. And this year, he has hit better than two of the other regulars in the Royals' lineup. Johnny Cueto sure gives this staff a different look, doesn't he? Cueto hasn't been quite as good for the Royals as he was for the Reds this year (strikeouts and ground ball rates are both down), but I see no reason to expect that he'll be anything but brilliant for them this postseason. 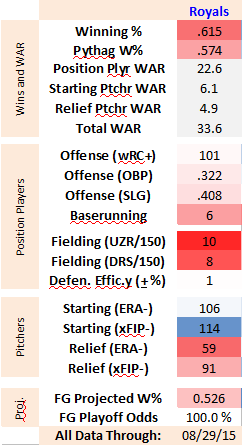 Following him will probably be their other former-Red, Edinson Volquez, who has also had himself a nice season. Volquez still walks too many, but he gets a good ground ball rate and strikes out his share of hitters. I still really like Yordano Ventura. Listed at 6'0", 180 lbs, he looks like a little dude out there. But he throws hard, has a nice breaking ball, and has looked good whenever I've had the chance to see him pitch. Their #4 pitcher will probably be one of Danny Duffy or Kris Medlen. Duffy hasn't been able to repeat the success he had last year. But Medlen has only just entered their rotation, but is an intriguing option for them. He's had fantastic success as a starter in the past, of course, and if they can keep him healthy and effective through the end of the year he could be a really nice boost to this staff. I could even see a scenario where he gets the second start of a playoff series, behind Cueto and before Volquez, on the strength of a strong September and significant veteran cred. He could be a really good choice, too. These guys are the best bullpen in baseball. Again. 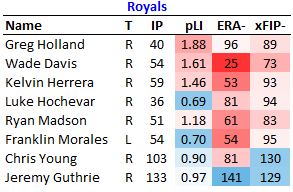 Greg Holland has actually had an off year, but it can't be overstated how brilliant Wade Davis and Kelvin Herrera have been. They don't even worry about left-right match-ups, really. Franklin Morales has been quality for them as the lone left-hander in this bullpen, and he barely is ever used in a high leverage situation. Ryan Madson has been used as their #4 reliever, and his season seems to indicate that he is still capable of closing. This kind of depth gives the Royals a really nice advantage in the offseason. Sure, they can ride Cueto to a 7- or 8-inning shutout, great. But in the other games, if Volquez or Ventura start getting hit, they can bring in their bullpen in the 4th inning and still have a relievers pitch one inning apiece for the rest of the game, knowing all of them have posted sub-100 xFIP-'s and ERA-'s this year.